Iron(II) sulfate, also known as ferrous sulfate or copperas, is a chemical compound. Its chemical formula is FeSO4. It is made of iron and sulfate ions. The iron is in its +2 oxidation state. 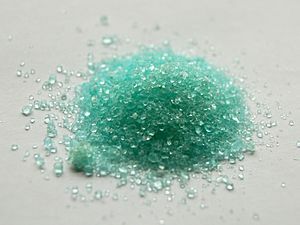 It is a blue-green crystalline solid when hydrated and white when anhydrous. It is a reducing agent. It reacts with oxygen in the air to produce a brown coating of iron(III) sulfate and iron(III) oxide. This coating is very corrosive. It dissolves in water to make a blue-green solution. When it is heated strongly, it breaks down into sulfur dioxide, sulfur trioxide, and iron(III) oxide. It reacts with nitric acid to make nitric oxide. It also reacts with chlorine to make iron(III) sulfate and iron(III) chloride. Iron(II) sulfate is found as a mineral. The greenish heptahydrate is the most common. It is made when sulfide minerals like pyrite are oxidized to sulfate. It is made by reacting iron with sulfuric acid. This reaction makes hydrogen gas and leaves behind iron(II) sulfate. It can also be made by oxidation of pyrite, an iron sulfide material. It is used to get the necessary iron in foods. It can reduce chromate in cement to harmless chromium compounds like chromium(III) oxide. It was also used to make ink. It can be used to color concrete. Iron(II) sulfate outside a titanium dioxide factory in Kaanaa, Pori, Finland. Iron(II) sulfate Facts for Kids. Kiddle Encyclopedia.